If you purchased the PlayStation VR and unpack it, you will notice that there are several accessories included in the box. Important are all HDMI and USB cables, so you can connect the necessary processor unit. This unit also ensures that you can connect the PS VR to the PC or Xbox One. However, it has one disadvantage: the processor unit is not capable of playing movies or videos with HDR. Once the PS VR is connected, you cannot get started yet. Make sure you get enough space, and clear all obstacles such as furniture, pets and items in front and next to you. Keep in mind that you have a VR glasses and will not notice your real environment. - Take care that no bright light falls into your room. Intense light can interfere with the LEDs. Therefore, you should dim the light sources in the room and draw the curtains so that no sunlight can penetrate. - Mirroring surfaces can also interfere with the signal. Glastic, mirror or a window behind you are already considered such a surface. Also glossy laminate or other flooring can reflect. - Also turn off the TV if nobody’s watching it. - In addition, you should ensure that you don’t block the signal through hidden LEDs. Two LED signals are installed at the rear of the PS VR. Always remember not to put your hair over the strap of the VR headset so they are not covered. - Make sure to sit a maximum of 3 meters away from the camera so that it can determine the signals well. - If the camera does not fit on your TV, you can also place it in front of it. However, it is important, that it is positioned optimally at the height of your head. - It is also important that the camera should not shake or slide. In addition to the camera, the positioning of the headset is also important. Especially spectacle wearers will have their problem at the beginning. If the VR glasses slip, the image can be blurred immediately. For some games there are short text tutorials which cannot be read correctly. Keep in mind that the glasses must sit properly when you take your hands off the unit. In this case, it usually slides down a few millimeters. So set it up a bit higher than usual. Another important point is the care of the headset. Be careful to clean the lenses. The lenses should be cleaned with a microfiber cloth. If you normally wear glasses, you can still use the VR headset. 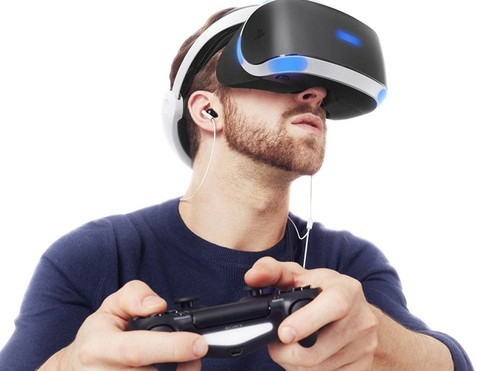 The PS VR offers the most comfortable VR experience for spectacle wearers. Just leave it on and set the headset on. If there is too much light in the headset, you should try a thinner frame or contact lens. In addition to the PS VR, you will also get Sony's in-ear headphones. They don’t look too good. If you want to go deeper into virtual reality, you can also buy other headsets. Make sure you first put the PlayStation VR on and then the headphones. However, in-ear headphones can be used better and don’t interfere with closed headsets. In principle, the move controllers are recommended for PS VR. With them the games are supposed to be more immersive, so you enter the game more quickly. If you want to buy these accessories, buy them in double pack - they don’t bring you anything. As an additional accessory, an Aim Controller is to be available in the future, which has been specially designed for shooter. - Take more breaks and stand in front of an open window. Breathe deeply in and out. - Don’t eat anything just before or while using headset. Especially severe meals can cause nausea. - If Motion Sickness occurs in Cinematic mode, you should push the position of the 2D image further backwards. You can change this in the settings. A smaller field of vision can minimize the nausea. Not all games are VR compatible. However, with the cinematic mode you can simulate an image on the VR headset. As soon as you start a game or a video, you only have to switch on the PlayStation VR. Then you can put the VR headset on and see a 2D image in front of you.